A lot of people get angry or feel aggravated when they arrive at Manila’s international airport and encounter the long, chaotic queues at the immigration section. 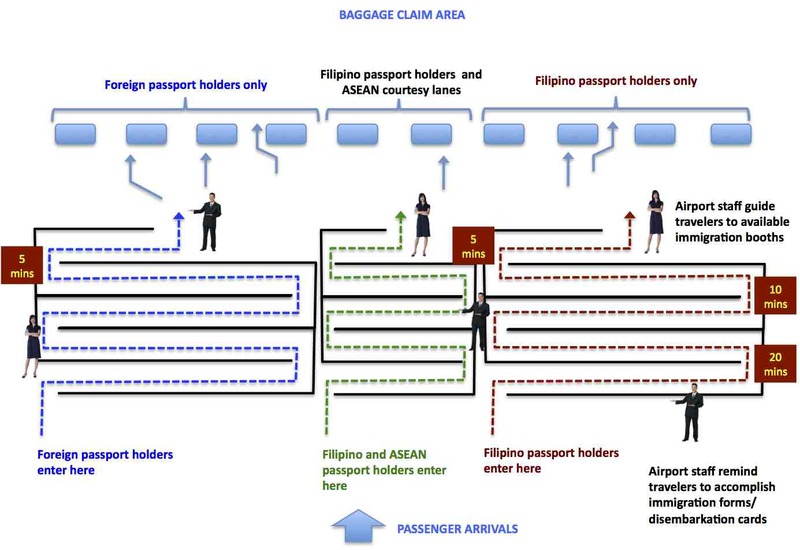 This is particularly the cases at NAIA’s Terminals 1 and 2, which handle the most international arrivals among the 3 terminals. Terminal 3 has significantly less passengers despite it being the hub of Cebu Pacific, which currently enjoys higher passenger loads compared to rival Philippine Airlines but apparently serves less international passengers than PAL. Multiple queues seem to merge into one mass of people, all eager to get to a booth for their passports to be stamped. Early on, you will hear a lot of people already complaining about the queues and stating out loud how the system could be improved. 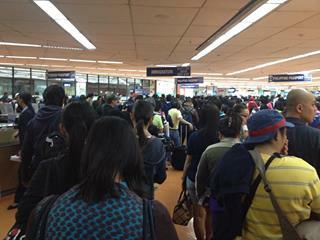 Another photo showing multiple queues at the immigration section for arrivals at the NAIA Terminal 1. I posted the figure above to be clear about the systems I’ve seen in other airports that worked quite well in being able to handle the large number of arriving passengers at the airports. It is more orderly and efficient, and to me at least, it is fair for all passengers who tend to shift to lines they think are moving faster but eventually are frustrated when the line turns out slower than their previous one. We’re hopeful that airport or immigration staff can improve the system and really soon as this will effectively cut down the times people spend at the airport terminals. By d0ctrine in Airports, Behavior on January 23, 2014 .